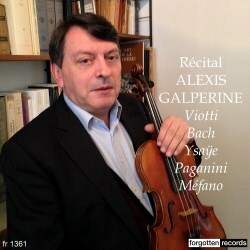 Alexis Galpérine, born in 1955, is a distinguished French violinist and a student of Roland Charmy, Ivan Galamian and Henryk Szeryng. A laureate at the Carl Flesch and Paganini competitions he has subsequently performed worldwide both as a soloist and chamber player. He’s also had a number of works dedicated to him - the programme includes Paul Méfano’s Alone, one of the best-known – and is a Professor at the Conservatoire National Supérieur de Musique de Paris. He is also known as a writer on musical topics and those who have followed Forgotten Records will have seen some of his essays in their booklets. The solo recital here was recorded at the Nancyphonies Festival in 2002 by Philippe Perrot, with the exception of Alone, which was taped in a studio two years later with the composer in attendance, artistically directing the performance. The challenges of a solo recital are met via variety: Galpérine plays Viotti, Bach, Ysaÿe and Paganini. Viotti’s Duet for solo violin, one of those whimsical, almost paradoxical-seeming titles, was dedicated to Cherubini and is played with great buoyancy of rhythm, precision, elegance and appreciation of the various voicings. He brings itto life very adeptly indeed. It’s followed by the great Chaconne, during which Galpérine conveys the music’s tireless monumentality. Brief passing imperfections such as string touching and a few intonational buckles are corollaries of a live performance. He doesn’t aim for cumulative expressive intensity and some passages sound somewhat columnar, rhythmically speaking, but it’s a performance nonetheless of rewarding directness. Ysaÿe’s Sixth Sonata was dedicated to the great Spanish violinist Manuel Quiroga who never left behind a major sonata or concerto recording but did set down a sequence of exquisitely performed genre pieces. The cycle of sonatas has been increasingly colonised by fiddlers of late, whereas for decades it was largely ignored on disc. Whilst he just misses the festive fanfare elements that launch the sonata he plays with commitment and a wide range of colour. He doesn’t fall into the trap of playing this sonata too fast, either. He ends with Paganini’s Nel cor più non mi sento variations, a piece beloved of finger gymnasts of old, such as the Czech master Vaša Příhoda, who souped up his own piano-accompanied version. Galpérine is appropriately ardent in the more expressive passages, and evocative in the whistling harmonies. The online catalogue of Méfano’s music states that Alone lasts twelve minutes but the performance under discussion lasts less than seven. As the composer was at hand, he must have sanctioned this. The studio acoustic here is chillier than in the live recital but the playing remains taut and resinous, the play of silence and active music-making reflecting the work’s expression-laden title. As for the recording, there is some ambient noise from the festival stage, as well as applause and performer shoe stamps in the Ysaÿe. in particular. A two-page portrait of the violinist, in French only, is printed in the booklet note. This is a good souvenir of his artful musicianship.